Many Nottinghamshire men and their military units fought in the Boer War (1899-1902) which took place in South Africa and was associated with Britain’s nineteenth century Imperial aspirations. The Dutch East India Company established a provision-station at the Cape of Good Hope in 1652. Having dispossessed the indigenous Khoikhois of their land a handful of burghers settled inland and called themselves Afrikaners speaking a creolized form of Dutch – Afrikaans. Some stayed close to Cape Town, growing wheat and making wine, while the Trekboer, the wandering pastoralist, moved further east and inland. He believed in hard manual work, and the Dutch Calvinist Church. He considered himself to be superior to the natives or kaffirs. By 1820 the British had annexed the Cape from the Dutch and brought in settlers to the eastern Cape. There was trouble between the Afrikaners and the native black population over land for grazing cattle. The last straw for the Afrikaners was the abolition of slavery in 1834 because they had relied heavily on slaves to do ‘kaffir’ work, which they believed was below them. In an attempt to find land where they could live by their own rules, a group headed east to Natal. They met with the formidable Zulus and nearly 300 Boers were killed. The lines were drawn for a major confrontation; one where the Afrikaans were ‘born’ – the Battle of Blood River. 3,000 Zulus were killed and only 3 Boers were injured. The territorial gains were short-lived because the British wanted the crucial sea port of Durban and annexed Natal in 1842. There was an uneasy truce, with skirmishes and frontier attacks over the next 50 years or so and nothing might have changed had it not been for 2 chance discoveries – the discovery of diamonds and gold fields in Kimberley. The prospect of riches changed the industry. Individual miners gave way to mining capitalists employing large numbers of black workers, who were paid considerably less than their white counterparts. It was this period which saw the emergence of Cecil Rhodes, the hugely influential imperialist. By 1891 Rhodes was responsible for 91% of the world’s diamond production. The actual ownership of the lands where the mines were situated continued to be disputed by the various Boer groups. Britain took the lead role and annexed the diamond fields and incorporated them into the Cape Colony. In 1886 a belt of gold-bearing reefs was discovered by an Australian close to Pretoria and by the mid-1890s the gold industry lay in the hands of a few powerful, predominantly European ‘Randlords’. The discovery led to a huge influx of white people into the Transvaal, which was essentially held by the Boers led by their president, Paul Kruger. The fear that these ‘Uitlanders’ might weaken the Afrikaners if they were allowed any power, meant they were refused the vote unless they had been resident in the Transvaal for over 14 years. Kruger was fearful that the British would attempt to annex this area once again, given that it was the ‘richest spot in the world’. Men like Rhodes, now Prime Minister of the Cape Colony, were pressing his ‘new imperialism’ on an already enthusiastic Britain, which was fearful of the expansion policies of countries like Germany, Belgium and Holland. It looked likely that Britain would make a move into the Transvaal. However, the move was instigated not from Britain but Rhodes himself and two of his cronies Alfred Beit and Dr Leander Jameson. Joseph Chamberlain, the British Colonial Secretary, was covertly involved, but in the wake of the disaster that followed denied all knowledge. The invasion of the Transvaal by Jameson was to have coincided with an uprising of Uitlanders in Johannesburg, but lack of organisation amongst the Uitlanders left Jameson and 500 troops to be easily defeated by the Boers. The results of this affair were disastrous for the individuals, Rhodes had to resign as Prime Minister, Jameson was sent for trial in England and Chamberlain narrowly avoided loosing his position. It also seemed that Britain had authorised an unprovoked invasion of a foreign state. So began a phase of British imperialism aimed at acquiring the vast gold deposits of the Tranvaal and ended up one of the longest, costliest and bloodiest wars since Waterloo. In two and half years over 60,000 lives were lost. Over half a million professional soldiers, including hundreds of Nottinghamshire men were sent to fight a war against 88,000 farmers. South Africa during the Boer War. Capt. R. L. Birkin, (later Colonel Commander of the South Notts Hussars). Several Nottinghamshire armed units played active roles in South Africa – the Sherwood Foresters, the Nottinghamshire Rifles, the Sherwood Rangers Yeomanry, South Notts Hussars Yeomanry and 17th Duke of Cambridge’s own Lancers (now amalgamated with others to form Queen’s Royal Lancers). After a shaky start the British army found itself in desperate need of reinforcements and the War Office decided to commit some Volunteer Forces at its disposal. Two hundred men of the Robin Hoods volunteered to form the 7th Battalion of the Sherwood Foresters, of which 30 were chosen to join a new Company which included men from the 4th Nottinghamshire Battalion. This Company left Southampton on 24th February 1900 aboard the “Avondale Castle”. After a short time they became part of a Brigade and marched to Johannesburg and Pretoria under the command of Lord Roberts reaching their destination in June of the same year. During this time they had taken part in three pitched battles and 20 minor engagements and marched over 1,700 miles. The other unit was the Nottinghamshire and Derbyshire Regiment, known as the Sherwood Foresters who were on manoeuvres in Malta at the out break of war under the command of Colonel L Smith Dorrien. The 1st Battalion was sent to South Africa in 1899. The second Battalion stayed in Malta and were trained as mounted infantry and later followed the First to South Africa. The fourth Battalion were in temporary barracks in Manchester when they volunteered as a whole Battalion; something quite unique in army history. They moved down to Nottingham and were sent off from the city. The Sherwood Foresters took part in several battles including Rustenberg, Moedival, Vlakfontein, Stormbergen and Bethulie Bridge. The latter was an important one because it meant keeping open direct lines of communication to Bloemfontein from Cape Town, Port Elizabeth and East London, all of which lay across the Orange River at Norval’s Pont and Bethulie. At Bethulie the river was two hundred yards across and the current very rapid. It would have been difficult to build a pontoon bridge, but the route was a necessary supply route and so General Gatacre were sent to prevent the bridge being destroyed by the Boers. The Battalion came under heavy fire and was pinned down but under cover of the night a Lieut. Popham, together with four volunteers, managed to get across the bridge and found explosives and wire, which they took back to their side, but not before a dog had given them away and they came under fire from the Boers who were awoken from their slumbers! The bridge was saved and its importance in regard to supplies, as the other bridges in the locality had been destroyed, cannot be overestimated. Lieut. Popham was awarded the DSO for his actions. Two men from the Sherwood Foresters were awarded the Victoria Cross for their bravery. Corporal Harry Churchill Beet who was native of Bingham was a Corporal in the 1st Battalion Mounted Infantry and stayed behind on a farm at Wakkerstroom to look after a wounded comrade, which was constantly under fire from the Boers until help arrived and they were able to return to the Battalion. He was decorated by the Duke of York (later King George V) on 4 August 1901 and later promoted to Sergeant. His VC and other campaign medals are in the Regimental Museum at Nottingham Castle. William Bees who was from Loughborough, was awarded his medal for his actions when his Maxim-Gun detachment came under fire and six of the nine men were hit. The wounded men cried out for water and Bees went under heavy fire to collect water in a kettle passing within yards of the Boers. He was awarded his medal by Lord Kitchener on 30th July 1902 and promoted to Corporal. His medals are also displayed in the Regimental Museum. The Sherwood Rangers Yeomanry raised a Service Squadron which was the first Yeomanry ever to go into action overseas. However, by the time the Sherwood Rangers arrived the Regular Army had largely restored the situation. They took part in a protracted mopping up operation preventing any resurgence of the Boer commandos at large. Their greatest achievement was in preventing a fanatical force of 1700 Boers from taking Lichtenberg. The South Notts Hussars Yeomanry sent two contingents and took part in various skirmishes. They were part of the 3rd Imperial yeomanry being one of the first Yeomanry Regiments to land in South Africa. A total of 23 South Notts Hussars were killed in action during the War. In February 1900 the 17th Lancers, who recruited from the county of Nottinghamshire, returned to South Africa but by this time all the large set piece battles had been concluded. The Division was employed in the pursuit of de Wet's Commando in a triangle between Pretoria, Mafeking and Bloemfontein. The most serious action involving the 17th was at Modderfontein where Smuts' Commando ambushed C Squadron. Although surrounded and out-numbered the squadron refused to surrender. Out of a total strength of 144, 3 officers and 32 soldiers were killed with 4 officers and 33 men being injured. 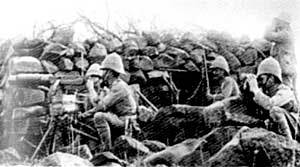 For the remainder of the Boer War the Regiment was engaged in clearing up operations. The Relief of Mafeking was celebrated in Nottingham on 24th May 1900, alongside the opening of the newly completed Victoria Station to the public for the first time. 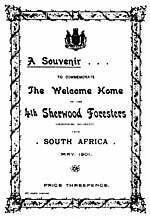 Souvenir programme for the welcome home of the 4th Sherwood Foresters from South Africa , May 1901. The local newspapers reported widely on the war but were extremely patriotic and said little about the failure of the British being down to a lack of preparation against a well-organised smaller Boer army. They also failed to report on the British scorched earth policy and the construction of the first concentration camps. There was reportage in the Nottingham Evening Post from November 1899 until May 1902 when it was claimed a Peace had been negotiated. The arrival of the Robin Hood Rifles in Nottingham after 14 months in South Africa was noted on 28 May 1902. The Evening Post for June 2 1902 proclaimed “PEACE! Boers accept the British terms.” There was general rejoicing and an announcement at St Marys Church in Nottingham. Clemency was given to 5 drunkards who were let off in court! Mansfield, Sutton in Ashfield and Hucknall raised flags and rang bells. The news took some time to reach Newark on the Sunday and although the town was slow to rejoice, flags were raised later in the day. Street names often reflect the local and national preoccupations, and personalities of the times. None more so than several streets off Colwick Road, Nottingham, recalling people and places from the Boer War. Lord Roberts, supreme commander of field forces in South Africa during the Boer war has two streets named after him – Lord Street and Roberts Street. 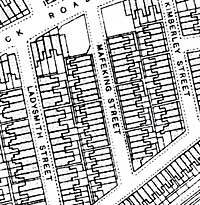 Three of the streets commemorate sieges: Kimberley Street, Ladysmith Street and Mafeking Street. The 22,000 people of Ladysmith were desperately short of food, fighting off the Boers until the very end when they were relieved by Sir Redvers Buller and his troops. Mafeking is probably the best known of the siege towns; for nearly eight months it was held by Col. Robert Baden-Powell until its relief, which saw great rejoicing back home in England. Baden –Powell is remembered in a street named after him as is Mary Kingsley, a traveller and author who studied African culture and was a champion of the native African. When she heard of the outbreak of war she went to South Africa to tend fever cases and died of enteric fever in 1900 whilst nursing Boer prisoners. She is commemorated in Kingsley Road. These streets were constructed shortly after the cessation of hostilities and residents moved in after 1902. The 25 Sherwood rangers Yeomen who lost their lives in South Africa are commemorated in a memorial window in the parish church of Retford, the site of the Regimental Headquarters at the time and on a memorial originally erected at Serlby and recently re erected at the training centre, Carlton, Nottingham. Many memorials were erected around Nottinghamshire to celebrate the men who fought in the Boer War. The main one in Nottingham can be found at the top of the Forest recreation ground on Forest Road.